August the 19th is World Honey Bee Day, and London Metropolitan University will be celebrating on Friday 18th August with trips for staff and students to see our own honey bee hives on the top of the Rocket building at the Holloway Road campus. The bees were installed last year as part of the sustainability project at London Met. In further London Met bee history, interior design students were asked to devise a bee habitat made with organic biodegradable materials and if possible use found or recycled materials, the results of which were exhibited in the within the KPMG offices Canary Wharf a couple of years ago. 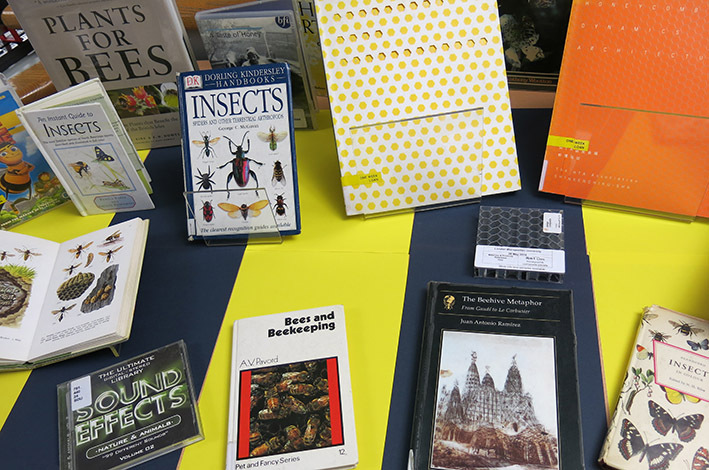 As some of Aldgate library staff make up one of the award winning teams in the London Met Green Impact programme we were keen to show our support for honey bees across the world, and have put together a display of bee related books in the library. Don’t forget many of our books are e-books – available to read online through the london met library catalogue, and log in with your username and password. This entry was posted in Blog, event, Library books, Library news and tagged art, Bees, book display, CASS, images. Bookmark the permalink.